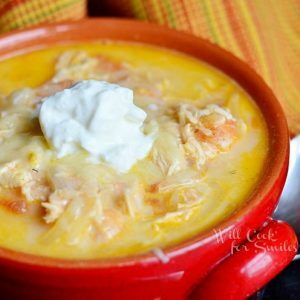 Homemade Creamy Chicken Enchilada Soup is a simple and comforting soup that captures the best chicken enchilada flavors. 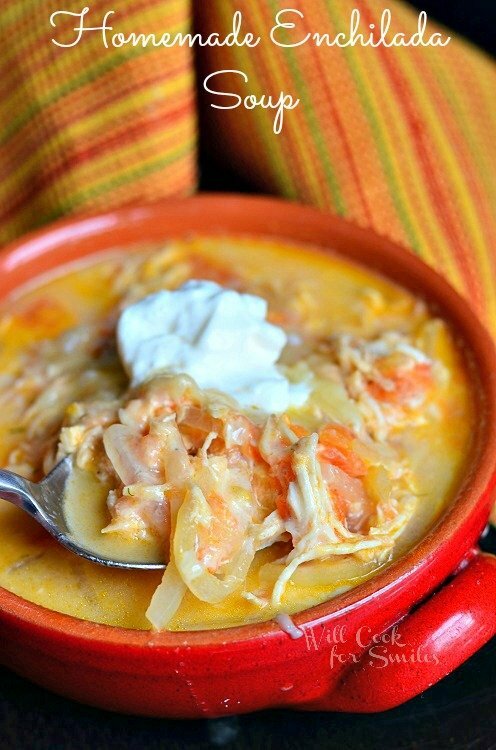 This Chicken Enchilada Soup is made creamy and topped with sour cream and cheese. 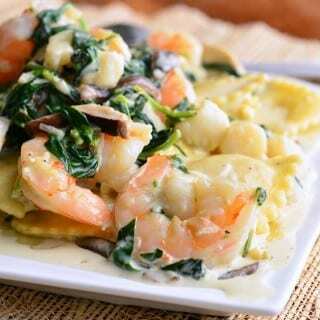 It’s the new year and the best way to start it is with some delicious food. Yes, I am talking about this homemade chicken enchilada soup. It’s calm and quiet now after the crazy, busy holiday time. That means it’s time for comfort and enjoying the cold weather from the warmth of the couch and a plush blanket. Don’t forget to grab a bowl of soup. 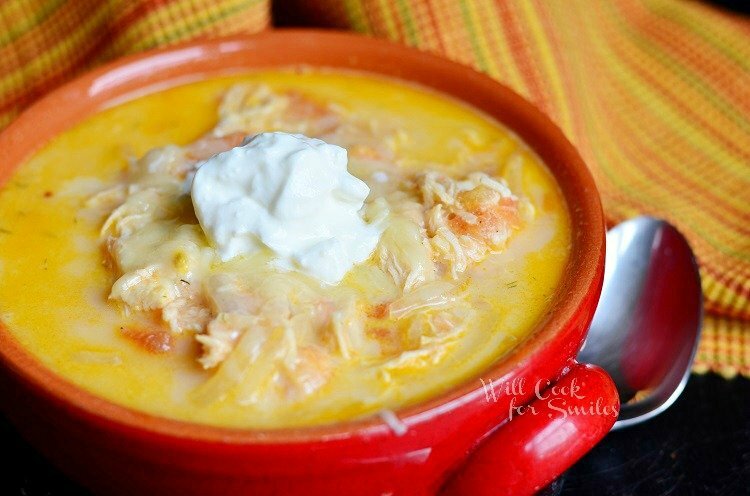 This creamy chicken enchilada soup turned out amazing! I love making new soups and I could probably write a book on all the soup recipes that I’ve made through the years. You can find many of them here, just please excuse the old photos. One of my blog goals is to re-shoot my old photos but life had been a little busy. Hoping that after I graduate in April, I will have extra time to beautify the old recipes. 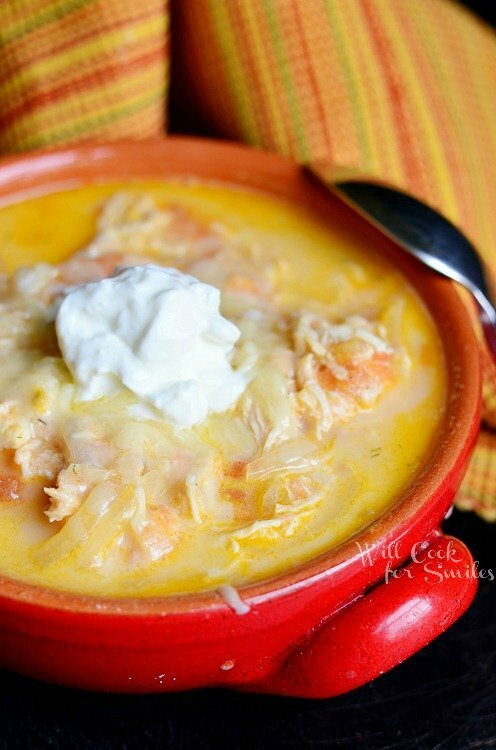 This Chicken Enchilada Soup is completely homemade. When I have a little bit extra time on my hands (or on weekends), I like to make homemade stock and I always prefer to use fresh ingredients. This soup is actually very easy, most of the time that goes into it is while the stock is cooking. 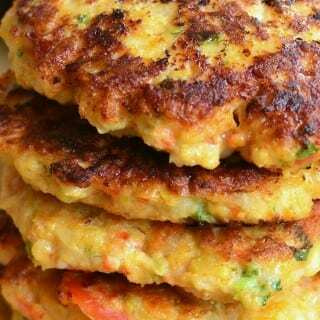 Few ingredients, minimal effort and unbelievably delicious results! The best way to make your own stock is to use meat on bone (or even just marrow bones). Bones add so much flavor and body to the stock, that’s why it’s preferred that you make stock with it. 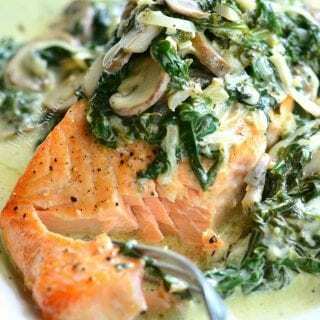 Another thing to remember when making your stock is to add the bay leaf and some vegetables while you are making it, in order to cook in those flavors. Just think ahead of the type of soup you are making and add appropriate veggies and herbs. In this chicken enchilada soup, I only used onion and bay leaf. 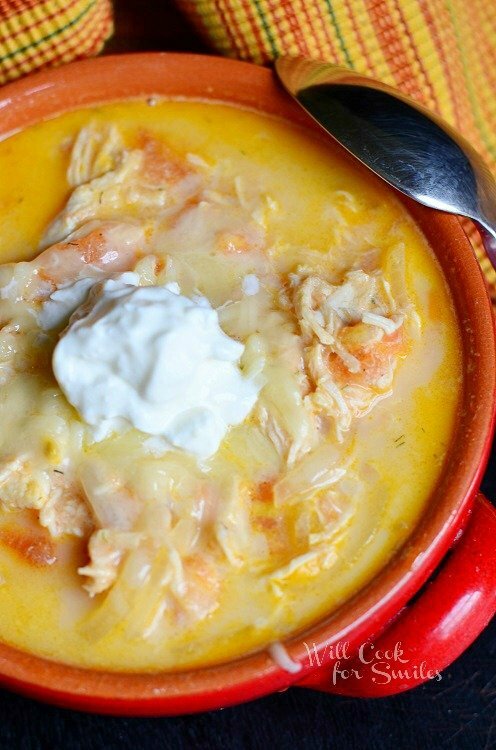 This Chicken Enchilada Soup is made creamy and topped with sour cream and cheese. Take out the chicken breast, shred it using two forks and set aside. Pour the stock into a separate container and set aside for a minute. Discard the bay leaf. Return the pot to the medium heat and add 1 tbs of vegetable oil. Dice the peeled tomatoes and add them to the pot. Salt the tomatoes a little, so they give out juice faster. Saute for a couple of minutes and add the shredded chicken. Add red pepper flakes and cumin. Taste to see if you need to add more salt. Cook on medium heat for about 15 minutes. Add the heavy cream and freshly minced cilantro. Cook for a couple more minutes and serve. 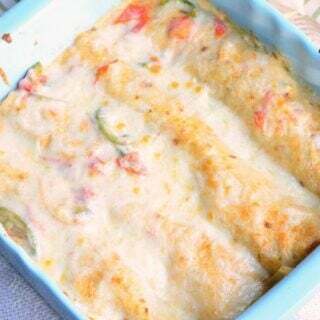 Top off with some cheese and sour cream before serving. Like I said, I have extensive soup archives and I’m not planning on stopping any time soon! Originally posted on Will Cook For Smiles on January 2, 2014. What a great soup to kick off the New Year with Lyuba! 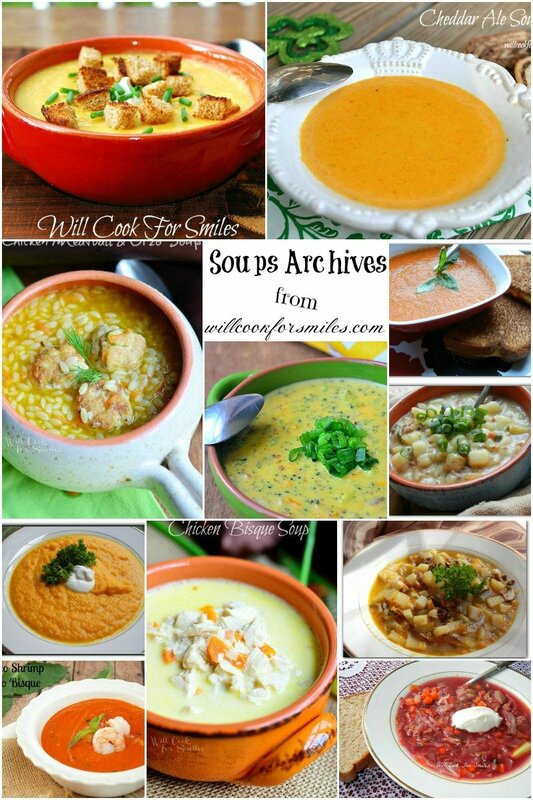 I love all of your soup recipes and this one is no exception – YUMMY! Pinned! Fantastic soup, Lyuba! Your collection of soups looks so tantalizing. I can’t get enough of soup in these cold winter months. Beautiful! It’s been so cold here in Wisconsin that I’ve wanted to eat soup for breakfast, lunch, and dinner for the past week! 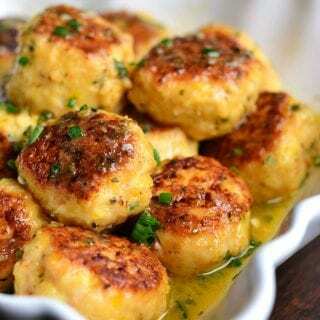 This recipe looks SO good, Lyuba! My daughter was just telling me that she is REALLY craving soup. This would be perfect! Yum! I could certainly go for a bowl of this on a cold day like today! We just can’t get enough soup lately, we will just love your Chicken Enchilada Soup. Thanks so much for sharing with Full Plate Thursday and have a great weekend! Can you use diced canned tomatoes instead of fresh ones? I’m thinking the fire roasted diced might be good. So sorry for the late response, Donna! Yes, you can use canned. The taste will be different though because canned and fresh tomatoes taste pretty different. Not a bad thing 🙂 it will just be a little different. This is calling my name! So comforting! Thanks for linking up with What’s Cookin’ Wednesday! 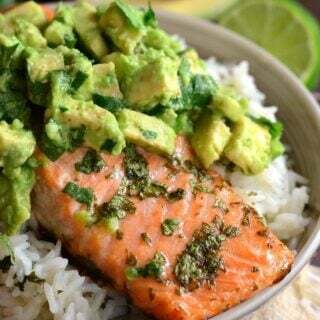 This looks so yummy for a cold, winter night! I just came across your site and I love soups, so I will be trying them out. Thank you for your site. Thank you, Maggie! I hope you enjoy them! I have a work luncheon and would like to make ahead and keep warm in crock pot for serving, I was wondering if it would tend to scorch? Connie, as long as you will keep the crock pot on a warm setting as opposed to actual cooking, you should be good. You can add a little extra stock while cooking it, just in case. 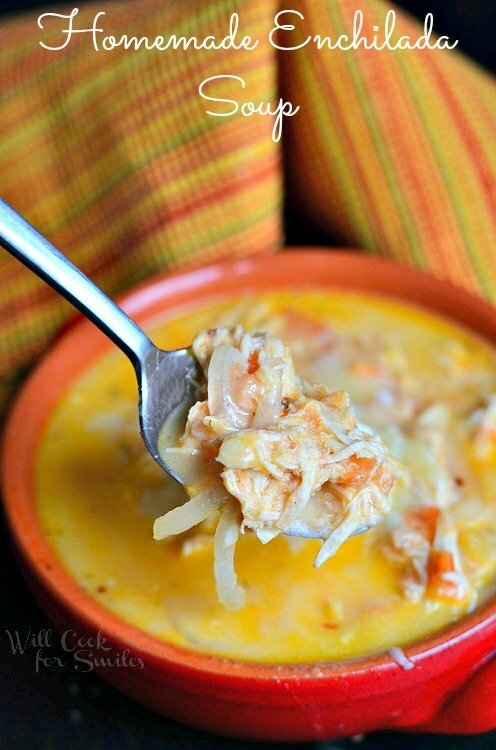 The Creamy Chicken Enchilada Soup is delicious! Easy to make (I used left over rotisserie chicken), and my family loved it. I’m looking forward to trying your other recipes. Thank you, Susan! I’m happy to hear that 🙂 Enjoy!